One might expect water to evaporate much faster than ice. Surprisingly, researchers from the University of Amsterdam have now shown that for small droplets of ice, this is not the case: ice and water droplets disappear equally quickly. This explains a fact that skiers know well: freshly fallen snow is very different from snow that is a few days old. The results were published in Nature Communications this week. If we put a glass of water on a table and wait for a long time, we expect the water to evaporate, but not the glass itself, or the table. In our experience, solid materials do not evaporate; we therefore intuitively expect ice, also a solid, to not evaporate significantly either. Nevertheless, such a process – known in physics terminology assublimation– does happen: skiers know, for example, that even if the temperature remains below freezing point, a few inches of snow can disappear in a couple of days. Although much less studied than the evaporation of liquids, the sublimation of solid ice has important consequences, as it impacts the climate (since ice reflects the sunlight) as well as the size and shape of ice particles in clouds (producing snowflakes, hailstones and ice pellets) and is of paramount importance for the formation of complex erosion patterns such as snow penitentes in snow fields at high altitudes. 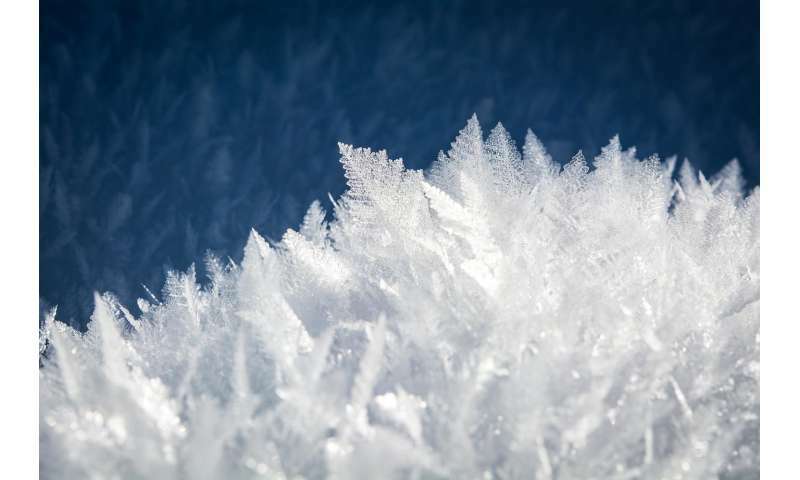 In research that was published in Nature Communications this week, physicists Etienne Jambon-Puillet, Noushine Shahidzadeh and Daniel Bonn from the University of Amsterdam studied the sublimation of small ice drops and snowflakes. Surprisingly, they found that under the same conditions, the sublimation of a frozen ice droplet happens just as quickly as the evaporation of the same drop when it is composed of liquid water. The researchers show that this surprising effect happens because both for liquid water and for ice, the speed of evaporation is limited by the process of diffusion: the way in which the resulting water vapor spreads slowly through the air. This conclusion holds for ice droplets, but also for snowflakes: these become more rounded during sublimation (see figure); a process that was previously attributed to the influence of the underlying crystalline structure. The researchers now argue that this crystalline structure is not as important as was previously thought: their diffusion arguments are sufficient to quantitatively explain the evolution of the snowflake shapes observed in experiments. The results therefore explain the difference between freshly fallen snow and snow of a few days old. But the conclusions are not just interesting for those who love to ski, as the applications are not limited to ice drops or snowflakes. The findings equally apply to the dissolution of small crystals, as their dynamics is governed by the same physics. Thus, the results can also be applied in controlling the size and shape of nanoparticles and salt crystals or the dissolution rate of pharmaceuticals. Climate change and snowmelt—turn up the heat, but what about humidity?